Chelsea considering Gianfranco Zola for caretaker role? Chelsea are reportedly considering the dismissal of Maurizio Sarri from the head coach role following the club's embarrassing 6-0 defeat to Manchester City on Sunday. The Blues have recently gone through a tough run on the road where they have failed to score a single goal in the calendar year and this has contributed to three straight away league defeats. 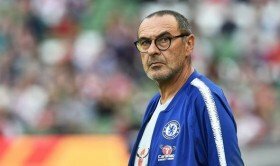 According to Sport Mediaset, the west London side are now mulling over axing Sarri from the helm with Zola a probable candidate to take over the reigns on a temporary basis. Zola is currently Sarri's assistant after joining alongside him last summer but he could be spared the sack, given his fruitful association with the club from his playing days. Chelsea are currently sixth in the league standings with 50 points, one adrift of Manchester United, who are now occupying the fourth position and most importantly a route into the next season's Champions League.